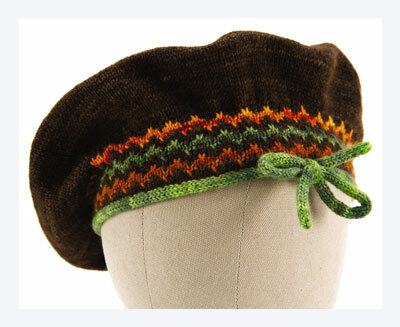 Worked entirely in the round, the Flambé beret and matching mittens are an excellent showcase for this simple flame-stitch border. Worked in luxurious hand-dyed yarn, the slipped stitches pop against their rich, dark background. Knitted cord edges provide a crisp and jaunty finish. ML: Insert right needle into next st, 2 rows below, and pull up a loop of yarn. Knit next st and pass loop over st just knit. With CC1 and smaller DPNs, work 5-st knitted cord for 35″. Run yarn tail through live sts to secure. Measure 7-1⁄2 (7)” from end of cord and place removable marker. With MC and larger circular needle, beginning at M, pick up and knit 140 (148) sts, ending 7-1⁄2 (7)” from end of cord. PM and join for working in rnds. 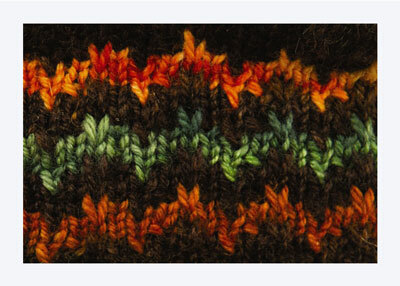 Work Rows 1–27 of flame-stitch chart once. With MC, *k1, kfb. Rep from * to end of rnd — 210 (222) sts. Work even until piece measures 5-1⁄2 (6)” from bottom of knitted cord. Place 6 markers so that there are 35 (37) sts between each pair. Dec 12 sts every other rnd as foll: *Ssk, work to 2 sts before M, k2tog. Rep from * to end of rnd. Rep dec rnd every other rnd 15 (16) more times — 18 sts. Next rnd: *Ssk, k1. Rep from * to end of rnd — 12 sts. Next rnd: Knit. Next rnd: [ssk] 6 times — 6 sts. Break yarn and thread through tapestry needle. Run yarn tail through last 6 sts, fastening securely on WS. 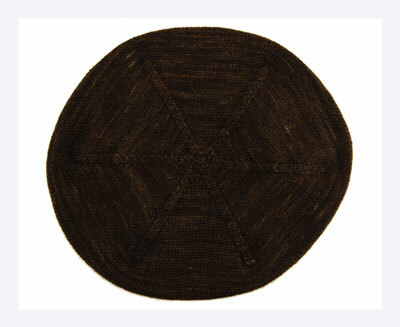 To finish weave in yarn tails and block, stretching gently over an 11″ dinner plate to shape. Tie cord ends in a bow. With CC1 and smaller DPNs, work 5-st knitted cord for 20″. Run yarn tail through live sts to secure. 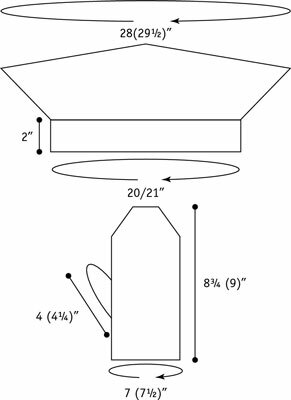 Measure 7-1⁄2 (7)” from end of cord and place removable marker. With MC and larger DPN, beg at M, pick up and knit 52 (56) sts, ending 7-1⁄2 (7)” from end of cord. PM and join for working in rnds. Next rnd: With MC, knit to end of rnd, then inc 1 st — 53 (57) sts. Next rnd: K26 (28), PM, M1L, k1, M1R, PM, knit to end of rnd — 55 (59) sts. Knit 1 rnd. Next rnd: K26 (28), sl M, M1L, knit to M, M1R, sl M, work to end of rnd — 2 sts inc’d. Knit 2 rnds. Rep incs every 3rd rnd 7 more times (19 sts between M). 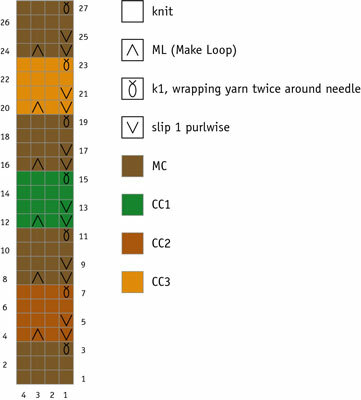 Next rnd: Knit to M, remove M, place next 19 sts on waste yarn for gusset (do not remove M), knit to end of rnd — 52 (56) sts. 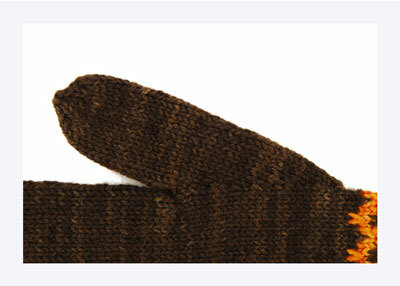 Next rnd: Knit to M, sl M, inc 1 st over gap that forms over thumb gusset, knit to end of rnd — 53 (57) sts. Work even until piece measures 7-1⁄4 (7-1⁄2)” from bottom of knitted cord. Dec 1 st at end of next rnd—52 (56) sts. Rnd 1: K1, ssk, knit to 3 sts before M, k2tog, k1, sl M, k1, ssk, knit to last 3 sts, k2tog, k1. Rep rnds 1 and 2 6 (7) more times—24 sts. Graft rem sts with Kitchener st.
Place held sts onto larger DPN and CO 1 st over gap formed by gusset — 20 sts. Work even until thumb measures 13⁄4 (2)” from pickup rnd. Next rnd: [K2tog] 10 times — 10 sts. Knit 1 rnd. Next rnd: [K2tog] 5 times — 5 sts. Break yarn and thread through rem 5 sts, gathering snugly. Fasten securely on WS. To finish weave in yarn tails on WS, darning gap at base of thumb closed. 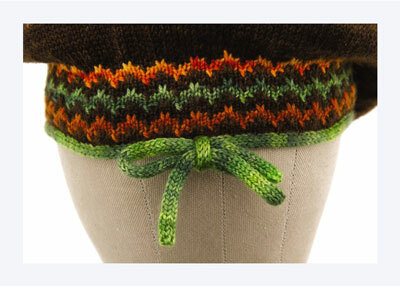 Tie ends of knitted cord in a bow. 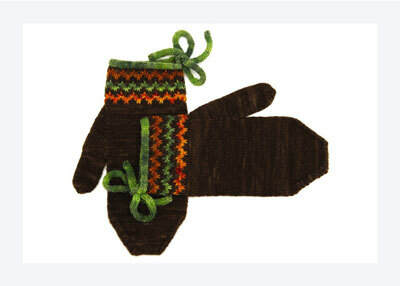 Make a second mitten to match. Flambé beret and mitten schematic.